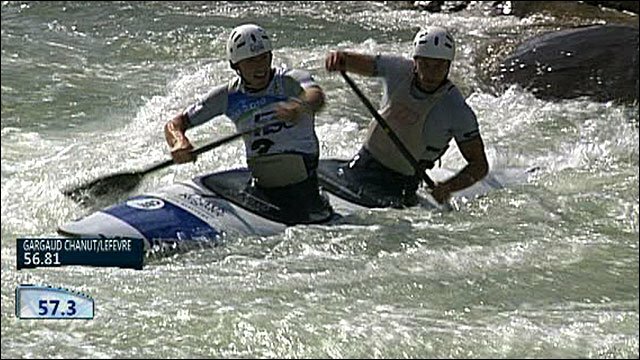 British pair David Florence and Richard Hounslow paddled to bronze in the men's canoe doubles at the World Canoe Slalom Championships in Slovenia on Saturday. 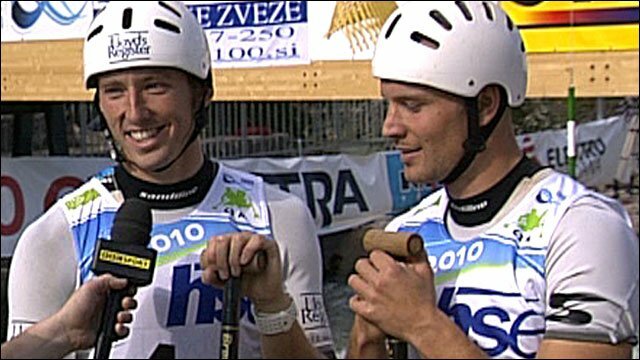 The Britons, second of the 10 finalists to go, set a time of 109.36 seconds with no penalties, as the Slovakian Hochschorner twins went on to win gold. A slow start kept the British out of second place, 0.36secs behind France's Denis Gargaud and Fabien Lefevre. In her K1 final, Fiona Pennie suffered a 50-second penalty and came eighth. 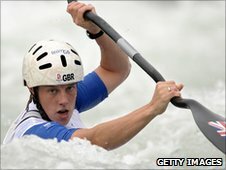 After recent successes on the world stage for Britain's sprint canoeists - Ed McKeever became world champion in the K1 200m sprint event in Poland last month - the GB slalom team have been looking to post a response at the challenging Tacen course, just north of the Slovenian capital, Ljubljana. Funding body UK Sport set the squad a target of one medal and four to five additional finalists from this event, which the British team here are now well on the way to achieving, with the medal already in the bag. Florence and Hounslow, European bronze medallists earlier this year and world bronze medallists in the C2 team event last year, scraped into the final after placing ninth in their semi-final. Gargaud and Lefevre set a quick time as the first boat out in the final and the British, lacking quite the same pace, made up for it by posting a clean run - as opposed to the French duo's four seconds of penalties for touching gates during their run. The two boats remained in first and second place until the final pair to take to the water, Pavol and Peter Hochschorner, strolled to gold in a blistering time of 105.35 seconds. And after racing so early in the final, Hounslow and Florence were thrilled that they're cautious strategy on certain gates had paid off as they hung on for bronze. "It's always interesting to sit and wait," reflected Florence. "But to go off second in the final and get into second place behind the French, we did a good job." Hounslow added: "We actually went for easier options on certain moves - on 11 and 12 the spin is the easier option to get through cleanly. "Two-second penalties are costly in this game. We had a good solid plan, and we did it and it worked out well for us. "We're really happy with bronze, we've only been in the C2 class for two years now, so this is pretty good." The second British C2 pair of Tim Baillie and Etienne Stott, fastest in Wednesday's heats, received a 50-second penalty for missing a gate in the semi-final and were consequently eliminated. And, in the women's K1 final, Pennie fell victim to a similar fate. Second to compete having qualified in ninth, she was soon out of the reckoning as she narrowly missed the upstream fourth gate in the opening section of the course. "I was surprised I'd been given a 50-second penalty," said Pennie, who appealed the decision. "Unfortunately I cut [gate four] a bit tight, and the video angle the judges look at wasn't very positive. Without that it would have been fourth position." Her team-mates, Lizzie Neave and Louise Donington, failed to progress beyond the semi-final, while Austria's Corinna Kuhnle took gold as one of just six canoeists to avoid at least one 50-second penalty. The Tacen course, wild in recent days following heavy rain which led to the cancellation of all racing on Thursday, quietened down for the weekend and was bathed in bright Slovenian sunshine on Saturday. Campbell Walsh will lead British hopes in the men's K1 event on Sunday, with Florence back in action in the C1 discipline, in which he won a silver medal at the Beijing Olympics in 2008. The World Championships are the last major competition for the British team in 2010, whose focus will shift to house-hunting once this event ends. In November, the team are set to move south en masse from Nottingham's Holme Pierrepont course to the newly constructed Lee Valley course, near London, which will host the 2012 Olympic canoe slalom races.